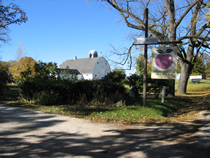 Friday I stopped at the Brightonwoods Orchard located on B off of 142 in Kenosha county. Very close to Bong Nature Prairie Recreation State Park. 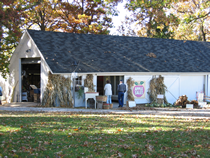 Brightonwoods is a 15 acre orchard with over 200 varieties of apples. I purchased Gala, Zestar, and Chenango Strawberry - all were very delicious! I wanted to try freezing apples this year. I peeled and cored the apples...spread then on a cookie sheet then froze them. I then filled quart bags with approx. 2 apples each. For my crock-pot oatmeal I need approx. two apples diced - I now have 12 quarts for my oatmeal making and one gallon bag with approx. 8 apples for a apple pie. Plus, they have a winery! I did a little wine tasting and purchased two bottles of the best tasting wine! Both wines are light and refreshing....perfect for my afternoon get-together with friends next Saturday! I will be returning to Brightonwoods in early October. I plan on making some applesauce so I need some more apples..plus I want to visit the winery again and check out some of the other wines they offer. If you live between Milwaukee and Chicago...I highly recommend taking a day trip to Brightonwoods Orchard. The country is beautiful and the orchard is a great place to purchase some unique varieties of apples and also check out their winery! Perfect Fall Day Trip! If you do not live near Brightonwoods Orchard...check out your local orchard. A day to the country and a orchard is a fun family day. How fun! I have never heard of the Chenango Strawberry apple before. What is it like? Chenango Strawberry apples are a sweet apple like a Gala. DELICIOUS!! !